Carsen Twarynski wants an NHL contract. The 20 year-old also wants to be one of the most dominant players on the ice. It is fair to say the well spoken left winger took another step to realizing both after a three goals effort Wednesday night in a 5-3 win over the visiting Prince George Cougars. Twarynski scored his team leading 16th, 17th and 18th goals of the season and is two goals shy of the career high 20 he scored as a member of the Calgary Hitmen two seasons ago. The Philadelphia Flyers third round selection must be signed by this June or he becomes a free agent. Twarynski now has three career hat-tricks in his career including two this season while scoring consecutive goals in four straight games. The Rockets have been excellent starters from the opening face-off this season and Wednesday was no exception. Twarynski opened the scoring just over 4 minutes into the game and the home team was off to the races for its 9th consecutive win at Prospera Place. The Cougars scored two late third period goals in garbage time to make it look respectable, but the home team was never in danger of losing this one. The Rockets improved to 9-3-0-0 against teams in the BC Division and are now 4-0-0-0 against the Cougars. The two teams won't meet again until three games in February including two at CN Centre. Is Dillon Dube better when Kole Lind isn't in the line-up? Odd statement yes, but if you look at the statistics it appears to be true. Dube scored a shorthanded goal in the first period that may be the best goal of the season by any Rockets forward. I thought Twarynski's shorthanded goal against the Medicine Hat Tigers Saturday was sweet, but Dube's 'shorty' was even better as he beat all five Cougars on the ice before scoring with a wrist shot to the top left corner of the net. Dube has points in 7 of his last 8 games and is shooting the puck way more now. In the last three games his shot total is 18. It should come as no surprise that the Calgary Flames second rounder has goals in 6 of his last 7 games and is only five goals shy from the 20 he scored a season ago. Lind missed his 6th straight game while Eric Gardiner sat out his 12th consecutive. Those are two top 6 forwards that are missing from the line-up. That's a huge loss for any team. I thought rookie Colum McGauley played his best game in a Rockets uniform. McGauley was way more involved in the play and made some nice passes. The 17 year-old was also awarded a penalty shot but failed to score. Liam Kindree has points in 8 of his last 10 games and continues to create offense playing with Dube and Twarynski. At one point in October the skilled forward went 10 games without a point. That's not good. Frankly it was concerning for a player who is crafty in the attacking zone and holds the highest hockey IQ of any of the Rockets first year forwards. Whoever moved him to the top line deserves a pat on the back. A skilled player like Kindree has to play with top end players, not with grinders. It was good to see Cal Foote find the back of the net. It was his first goal in 10 games. With the type of shot Foote possesses, he shouldn't go through those types of dry spells. With an assist Wednesday night, the captain is now two shy of 100 for his career. Nolan Foote returned to the line-up against the Cougars after being hurt against the Lethbridge Hurricanes November 17th. Nolan also celebrated his 17th birthday Wednesday night. The game again featured American born goalies going toe-to-toe. James Porter, from Idaho, faced fellow 17 year-old rookie Isaiah DiLaura, who was born and raised in Lakeville, Minnesota. Porter was a 7th round bantam pick while DiLaura was a 8th rounder. The Rockets now head to Spokane for a date with the Chiefs Friday night before playing their final home game before the Christmas break Saturday against the visiting Kootenay Ice. A terrific conversation before the game tonight with Czech Republic born forward Marek Skrvne. When approached to do an interview, he was apprehensive. Once we sat down and talked, the 18 year-old was terrific. Well spoken, smart and his English was excellent. It was one of the most impressive interviews I've conducted with a first year player this season. The Rockets closed out November with a record of 8-3-1-0 in 12 games. One word - impressive! Roman Basran. Welcome to the Kelowna Rockets record books. The rookie goalie received his first career WHL start Saturday night against the Medicine Hat Tigers and delivered a flawless performance in a 4-0 win. Basran became the first 16 year-old, ever, to earn a shutout in his first career start with a 38 save performance. And yes, with a huge smile on his face he accepted the first star award at games end. Basran, a third round bantam pick of the Rockets from 2016, made several sensational saves and had Tigers leading scorer Mark Rassell's number all night long. The 20 year-old forward, who had his 8 game goal scoring streak snapped, often looked to the heavens when denied by the rookie goaltender. Basran became the first Rockets 16 year-old goaltender to start a game since Josh Lepp way back in the 2001 season. Lepp, a first round bantam pick, also faced 48 shots on October 3, 2001 but his outing didn't go so well. Lepp allowed 7 goals in a 7-5 loss to the Portland Winterhawks. While Basran enters the record books, he isn't the first rookie goalie to earn a win in his first career start. Adam Brown, at the tender age of 17, won his first career start October 11, 2008 against Prince George in a 8-1 win. Brown was forced to make just 11 saves in the victory. Brown started his rookie season with 7 consecutive wins. Impressive. Jordon Cooke, also 17 at the time, made 35 saves in a 4-3 shootout victory in Everett October 10, 2010 in his first career start. Like Basran, both Brown and Cooke both saw game action in a relief appearance prior to getting their first official start. Basran relieved James Porter in Vancouver in a 6-1 road loss last Saturday. The youngest goalie ever to see game action in a Rockets uniform is Jake Morrissey. On December 16th, 2012, as an emergency call-up, Morrissey entered the game in relief of an injured Jackson Whistle in the third period. Morrissey made 7 of 10 saves in a 6-2 loss to the Calgary Hitmen. Morrissey was only 15 at the time. Let's remember, Basran comes with much fanfare. The 16 year-old was a third round bantam pick in 2016, the highest selection the Rockets organization has made at that position since using the 4th overall pick in 2001 to claim Josh Lepp. Lepp, sadly, did not become the goaltender director of player personnel Lorne Frey envisioned. Lepp would be traded away to Red Deer before ending his career in Moose Jaw. Since Josh Lepp, Frey has been shy of taking goalies early in the draft. Jordon Cooke was a 4th round selection in 2008 and appears to be the best goaltender they've ever taken, considering the Leduc, Alberta product was a second team all-star at 19 and a first team Western Conference all-star and WHL goalie of the year at 20. We should also mention Cooke was the CHL goaltender of the year in his final season of major junior hockey. The Rockets just don't play 16 year-old goalies. They just don't like them on the roster. They are better served playing midget and Basran is no exception. The plan was for the Delta, BC product to start the season in the BCMMHL with the Okanagan Rockets, but those plans went down the toilet when 19 year-old Brodan Salmond was injured. 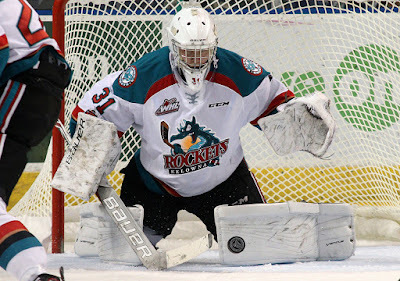 Traditionally older goaltenders are employed by the Kelowna Rockets, with 19 and 20 year-old's being a staple in these parts. Kevin Swanson, Shane Bendera (did not play as a 20 year-old), Kelly Guard, Mark Guggenberger, Kristofer Westblom, Adam Brown, Jordon Cooke, Jackson Whistle and Michael Herringer have all played as overage goalies. In no less than six of the examples above, those goalies were all acquired via trade. Derek Yeomans would have played with the Rockets as a 20 year-old too, but he was dealt to the Seattle Thunderbirds for defenceman Clayton Barthel in a pre-season deal in 2006. Ok, enough about the goaltending. Last night's 4-0 win over the Tigers was a game where Medicine Hat dominated territorally, yet the Rockets were clearly the more opportunistic team. Generating a season low 16 shots on goal, Basran made timely saves, Liam Kindree opened the scoring and the penalty killing unit was nothing short of terrific. The Tigers were granted 7 chances with the man advantage, but the PK unit kept them primarily to the outside. What surprised me was the visitors propensity to feed defenceman David Quenneville on one-timers. I get the fact that the 19 year-old can shoot it a ton, but the Rockets sniffed that play out time and time again and blocked numerous shots that the New York Islanders 7th round draft pick was trying to unload towards the goal. The shot blocking clinic was impressive, especially from Liam Kindree, Connor Bruggen-Cate and James Hilsendager to name a few. Carsen Twarynski's shorthanded goal in the second period was magical. It was a work of art. Watch it on video replay. The just turned 20 year-old scored his team leading 15th goal of the season on a tremendous individual effort. It was a power move that few can pull off. It should be WHL Plays of the Week worthy. Twarynski is 5 goals shy of his career high of 20 set two seasons ago with the Calgary Hitmen. Oh, how about his hit in the third period on Tigers forward James Hamblin? Clean and crushing!! Congratulations to Dillon Dube for hitting the 100 assist mark in his career. The 19 year-old now has points in 8 of his last 10 games and has goals in 5 of his last 6 games. The Rockets have won 8 consecutive games at Prospera Place. The last loss came back on October 20th in a 3-1 setback to the Portland Winterhawks. The win last night moved the Rockets 7 points up on Vancouver in the fight for second place in the BC Division. The first Royals remain 6 points ahead having played two more games. The Kelowna Rockets coaching staff challenged the rookies to make an impact prior to Saturday’s 3-2 road win in Vancouver. Those first year players delivered in spades. Where do we start? How about 17 year-old goaltender James Porter who appeared to get increasingly better as the game went along. Named the first star, Porter made 30 saves as he helped his team snap a two game road losing streak. Marek Skrvne. Last weekend he scored his first career goal at the Langley Events Centre in a 6-1 loss. Fast forward six days later and the first year forward is involved in his first career WHL fight with Giants tough guy Darian Skeoch. Being a betting man, my belief is A) Skrvne has never Googled Hockeyfights.com or B) Skrvne has never been involved in a hockey fight of any kind growing up in the Czech Republic. What I saw from Skrvne was impressive as he stood up for teammate Kyle Topping after he was dumped by Skeoch just inside the Giants blue line. Skrvne, clearly unaware of the 6 foot 4, 216 pounds reputation, grabbed a hold of the much larger player, took off his gloves first and attempted to throw a punch. Skeoch threw no less than four solid lefts back, leaving Skrvne crumpled on the ice. But that’s not the point here. Skrvne answered the bell. The 5 foot 9 forward stepped out of his comfort zone, big time, because he was challenged to make an impact. He showed up, didn't cower and his teammates loved him for it. Kaedan Korczak. Since returning from the World Under 17 Hockey Challenge in Dawson Creek/Fort St. John, the 16 year-old may have come back with a slight loss of confidence. That didn’t appear to be the case Saturday night though. The pride of Yorkton, Saskatchewan played a solid game on defence. Korczak was more proactive in shooting the puck from the blue line than passing it and was involved in his first career WHL fight. Korczak dropped his gloves with fellow 16 year-old Giants defenceman Bowen Byram. Korczak showed he can handle himself as he made short work of Byram, with both defenders typically doing their best work with the gloves on, not off. Again, that isn’t the point here. The Rockets first round bantam pick from 2016 showed he can 'muscle up' if he needs and his thumbs up to the Rockets bench with a huge grin on his face after the fight was over was a tremendous ending to the spirited tilt. One pass. Yes, just one pass that caught my eye came from rookie Libor Zabransky. The 17 year-old rookie was sent a pass from his d-partner behind his own goal. Zabransky didn’t panic, took it to the side of his net and ripped a tape-to-tape pass onto the blade of Kyle Topping at centre ice. Topping skates in on an odd man rush and almost scored. What I liked about that one sequence was Zabransky’s poise with the puck. No panic. No sheepishness with it. Composure with the puck and a beautiful outlet pass that was marvelous to witness. It may be a small play for some but a significant progression as Zabransky adjusts to a smaller ice surface with bigger, older players. Again, another rookie making an impact. The Rockets took too many penalties in the game. The Giants were awarded eight power play chances. Fortunately the teams commitment to getting into shooting lanes, blocking shots and simply harassing puck carriers was nothing short of excellent. The end results had the penalty killing unit going 7 for 8 and scoring a shorthanded goal. Carsen Twarynski celebrated his 20th birthday Saturday night by scoring his 14th goal of the season just 90 seconds into the hockey game. The Rockets are now 11-1-1-1 when they open the scoring. After two sub par efforts in a 6-1 loss to the Giants last Saturday and a 6-2 setback in Spokane Wednesday night, it will be interesting to see what this latest win does for the Rockets heading into Saturday’s home game with the high flying Medicine Hat Tigers. If the rookies can again rise to the occasion by doing anything for the greater good of the team, I can’t see why another win isn’t attainable. 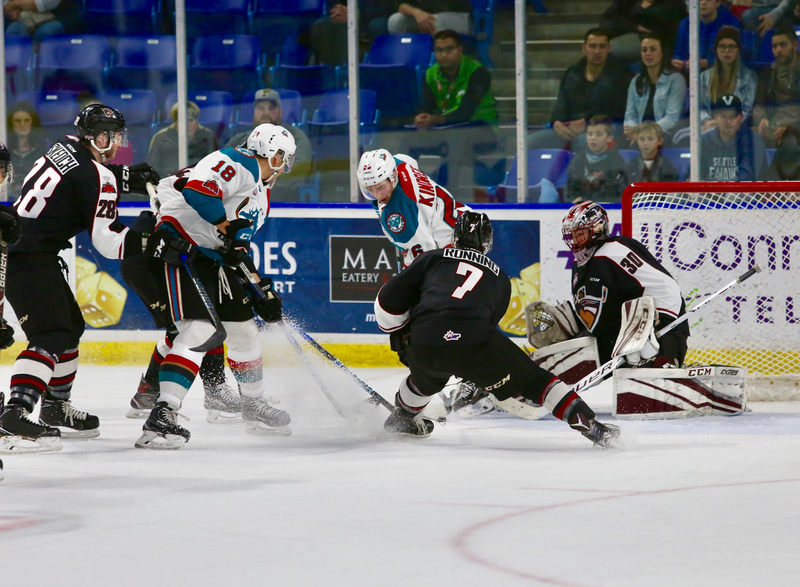 Rockets/Giants Preview: This is the third of eight meetings between the Kelowna Rockets and Vancouver Giants this season. The Rockets are 1-1-0-0 after a 5-4 overtime win back on November 10th before losing 6-1 back on November 18th. The Rockets power play is 3 for 8 (37.5%) in the seasonal series while the Giants are an impressive 5 for 7 (71.4%). In the last 26 regular season games between the two teams, the Rockets are 22-4-0-0. Following tonight’s game, these two teams don’t meet again until January 13th. 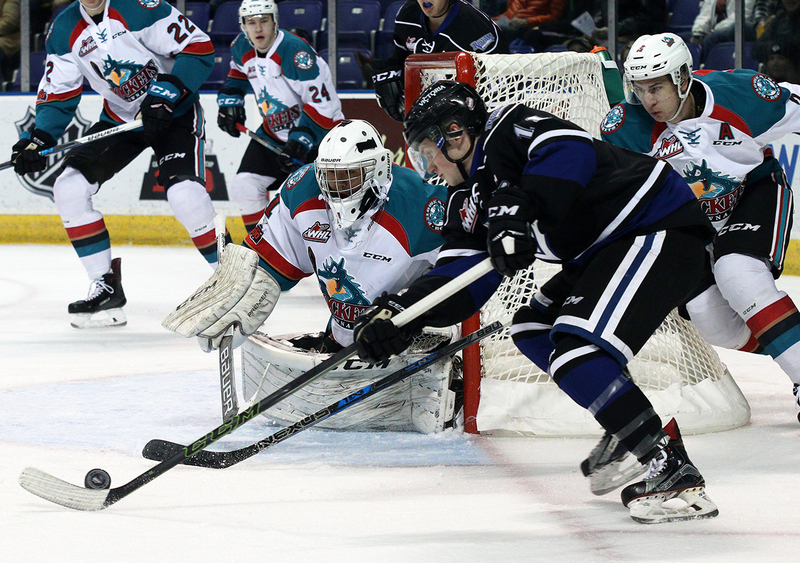 The Rockets are coming off a 6-2 loss Wednesday night in Spokane. Connor Bruggen-Cate and Carsen Twarynski scored in the setback. This is game three of a three game road trip for the Rockets (0-2-0-0), who host Central Division Medicine Hat tomorrow night. The Rockets have points in 6 of their last 9 games and overall have won 4 of their last 6 games. Hockey Hotbed: The Kelowna Rockets are in their 27th year of existence since coming into the Western Hockey League as an expansion franchise in 1991. After four seasons in Tacoma, the team relocated to Kelowna in 1995-96, where the team has spent the last 22 years in the Okanagan. The team has four WHL championships (2003, 2005, 2009, 2015) and have missed the playoffs only once in their existence. The hockey club has made four straight appearances in the Western Conference final and has registered 40 or more wins in five consecutive seasons. Broadcasters Notebook: The Rockets have won 7 straight games on home ice with wins over Portland, Tri City, Prince George, Vancouver, Red Deer, Edmonton and Lethbridge….The Rockets have scored 25 goals in their last 6 games….The Rockets played their 16 hundredth regular season game in franchise history Novembr 3rd in Victoria in a 4-2 win…Carsen Twarynski has 10 goals in his last 12 games….James Porter has started in 15 of the last 18 games…The Rockets are 4 and 2 in overtime with game winners coming from Kole Lind, Dillon Dube Carsen Twarynski (twice). The only loss in OT came against the Tri City Americans and Portland Winterhawks…The Rockets are 5-3-1-0 in the second of back-to-back games….November birthdays include Kyle Topping (Nov 18th), Carsen Twarynski (Nov 24th) and Nolan Foote (Nov 29th). Who’s Hot? Liam Kindree has 2+7=9 in his last 7 games….Kole Lind is riding a 7 game point streak (3+7=10)…Leif Mattson has goals in 7 of his last 12 games.…Kyle Topping has points in 8 of his last 13 games (5+8=13) and has points in 11 of his last 17 games…Gordie Ballhorn has points in 8 of his last 12 games (1+11=12)…Goalie James Porter is 8-2-0-1 in his last 11 starts. Milestones: Dillon Dube is 1 assists shy of 100 in his career…Carsen Twarynski played in his 200th career game October 28th against the Prince George Cougars…James Hilsendager plays in his 200th career game November 14th vs. Oil Kings. Dan Lambert isn’t afraid to show emotion. He often expressed himself freely with overflowing joy or disappointment when guiding the Kelowna Rockets to a WHL championship in 2015. That’s why he was so likable. So, here he was Wednesday night at Spokane’s Veteran’s Memorial Arena facing his old team for the very first time as the head coach of the Spokane Chiefs. When the buzzer sounded at games end, Lambert shook the hand of assistant Scott Burt and calmly walked off the bench after a 6-2 home ice win. What couldn’t be detected was the 47 year-old’s satisfaction that he undoubtedly felt from within after beating his old team for the first time since leaving the organization for the NHL's Buffalo Sabres back on July 6, 2015. After two short seasons in pro, Lambert was relieved of his duties but quickly caught on with the Chiefs who had a coaching vacancy when they parted ways with Don Nachbaur. Facing your old team, whether it be a player or a coach for the first time is never easy, but Lambert knows another emotional hurdle awaits him when he visits Prospera Place for the first time on January 10th. The Chiefs were the dominant team in this one with the shot clock telling the story as the home team fired 46 shots towards Rockets starter James Porter. The visitors, looking at getting back in the win column on the road for the first time since a 4-2 victory in Victoria November 3rd, fired only 11 shots at the Spokane net and only 20 at games end. The Chiefs scored two quick goals in the second period and then sealed the game with two quick strikes late in the third period. Despite being out-played territorially in the opening period and being out-scored 2-0, the Rockets rallied with two quick goals from Connor Bruggen-Cate and Carsen Twarynski :16 seconds apart. But if any momentum was to be gained, neither team was affected by it. The Chiefs would remain in relative control before scoring two late-second period goals to regain a two goal edge. The Rockets welcomed Dillon Dube and Jack Cowell into the line-up Wednesday after both were unable to play in last Saturday’s 6-1 loss in Vancouver. Both were held off the score-sheet, but for a team that lacks depth, those two were solid additions with the team playing its third consecutive game without leading scorer Kole Lind. I think it is safe to say depth, or in the Rockets case, a lack of depth has been clearly evident the last few games. If the big horses (Dube/Lind/Twarynski/Foote) are not galloping at full speed, it is really tough to compete against elite competition. I can’t see how the Chiefs can’t be in the elite category despite struggles on home ice where they have just 5 regulation wins in 12 games. I would say the best rookie this season has been goaltender James Porter and he is significantly ahead of those teammates that are considered to be first year players. Let's hope Lind, Eric Gardiner and Nolan Foote get healthy, allowing those first year players more time to find their footing. Speaking of young players, I really liked what I saw from 17 year-old Chiefs forward Eli Zummack. The Kelowna kid seems to play especially good against the Rockets, scoring the 4th goal of the game late in the second period with one second remaining. Zummack is a second round pick of the Red Deer Rebels and was obtained in the Adam Helewka trade in January, 2016. I thought if the Roockets could get out of the second period only down by one they had a chance to rally, but not adhering to clock management essentially put the game out of reach for the visitors. While fighting is down in junior hockey, it is always nice to see some rough stuff. With the game 54 minutes old, 20 year-old defenceman Gordie Ballhorn dropped the gloves behind the Rockets net with Chiefs forward Jake McGrew. For McGrew, it was his first fight in the WHL. Ballhorn has only 8 fighting major to his credit, so while slightly older than McGrew, Ballhorn is my no means a pugilist. That said, it is nice to see an older player display some anger and frustration by taking it out on an opponent. While failing to gain ground on first place Victoria, the Rockets didn't lose any either to the third place Vancouver Giants. The G-Men suffered a 5-2 loss Wednesday night to the surging Lethbridge Hurricanes. 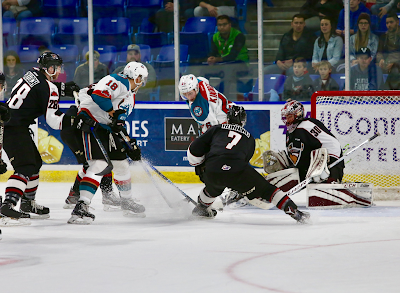 The Rockets face the Giants Friday at the Langley Events Centre with the two teams separated by only three points. The Rockets have played one fewer game. Rockets/Chiefs Preview: This is the first of four meetings between these two teams this season. The Rockets make a return visit in 9 days with a game in Spokane on December 1st. The Chiefs are in Kelowna January 10th and March 4th. In three of the four meetings last season, the games went into overtime with the Chiefs winning all three. In the last five seasons the Rockets are 4-0-2-0 at Veterans Memorial Arena and 7-1-4-0 in the last 12 regular season meetings overall. The Rockets are coming off a 6-1 loss in Vancouver Saturday night. Marek Skrvne scored the lone goal. This is game two of a three game road trip, which has the Rockets in Vancouver Friday night before hosting Medicine Hat on Saturday. The Rockets have points in 6 of their last 8 games and overall have won 4 of their last 5 games. Broadcasters Notebook: The Rockets face a team tonight whose coach they are very familiar with. Dan Lambert is in his first season behind the bench of the Spokane Chiefs after being hired June 7th. Lambert led the Rockets to a 2015 WHL championship before leaving the organization for the NHL’s Buffalo Sabres…The Rockets have won 7 straight games on home ice with wins over Portland, Tri City, Prince George, Vancouver, Red Deer, Edmonton and Lethbridge….The Rockets have scored 23 goals in their last 5 games….The Rockets played their 16 hundredth regular season game in franchise history Novembr 3rd in Victoria in a 4-2 win…Carsen Twarynski has 9 goals in his last 11 games….James Porter has started in 14 of the last 17 games…The Rockets are 4 and 2 in overtime with game winners coming from Kole Lind, Dillon Dube Carsen Twarynski (twice). The only loss in OT came against the Tri City Americans and Portland Winterhawks…The Rockets are 5-3-1-0 in the second of back-to-back games….November birthdays include Kyle Topping (Nov 18th), Carsen Twarynski (Nov 24th) and Nolan Foote (Nov 29th). Who’s Hot? Liam Kindree has 2+6=8 in his last 6 games….Kole Lind is riding a 7 game point streak (3+7=10)…Leif Mattson has goals in 7 of his last 11 games.…Kyle Topping has points in 8 of his last 12 games (5+8=13) and has points in 11 of his last 16 games…Gordie Ballhorn has points in 8 of his last 11 games (1+11=12)…Goalie James Porter is 8-1-0-1 in his last 10 starts. Key injuries to the Kelowna Rockets top end players and a lineup consisting of three defencemen playing forward added up to an expected result in a 6-1 loss in Vancouver Saturday night. With Dillon Dube scratched after being named the first star in Friday's 7-4 win over Lethbridge, every player on the Rockets roster was asked to elevate their play and essentially play more minutes than they are accustomed to playing. Marek Skrvne, a fourth line centre, was elevated to the second line and probably had more ice time Saturday night than he did in the first 18 games of the WHL career combined. Skrvne would score his first career goal, a power play marker in the third period, to erase the shutout bid by Giants goaltender David Tendeck. That was one of few bright spots on the score-sheet. Dube wasn't the only key player who didn't dress in Saturday's setback. For a second straight game leading scorer Kole Lind was ill and third line centre Jack Cowell and Nolan Foote were hurt in Friday's game. Throw Erik Gardiner's injury into the mix and the Rockets were playing without four of their top 6 forwards. That said, despite being short-staffed, the entire defensive core remained intact. The team was able to dress its three 20 year-old's, so it wasn't like the visitors were a glorified midget team against the G-Men. As mentioned, with the d-core essentially unscathed from Friday's physical affair against the Hurricanes, my hope was the game would be low scoring and the play inside the Rockets zone would be controlled and calculated. Sadly it wasn't, with the Giants handling the puck for a significant amount of time in and around goaltender James Porter. The game took a turn for the worse when Libor Zabransky took a tripping minor penalty and then team captain Cal Foote followed suit 1:48 seconds later. The Giants scored on a 5 on 3 with one second remaining in the two-man-advantage and then Tyler Benson's tap in goal from the front of the net 89 seconds later had the visitors in a hole that they would never recover from. Two more goals in a span of about 90 seconds late in the first period and it was pretty much a done deal. While unable to create a lot of scoring chances, a few good looks early in the game had things looking promising for the Rockets. I thought Carsen Twarynski, Kyle Topping and Liam Kindree had several solid chances, including Kindree robbed on a rebound when the game was still scoreless. While not overly tested, Giants goaltender David Tendeck has to be applauded for coming up big when the game was still in doubt. Tendeck was named the second star. Kyle Topping had a chance to score his 10th goal of the season when he was awarded a third period penalty shot. Unfortunately, Topping missed the net as he attempted to go glove side on the right handed catching goalie. While Marek Skrvne's first goal of the season was a bright spot, the game also marked the WHL debut of 16 year-old Roman Basran. The third round bantam pick made 17 of 19 saves after relieving starter James Porter after the first period. With so many key players missing from the line-up, the game allowed me a chance to see the future of the Rockets younger players. These third and fourth line players don't receive much ice time when the top 6 forwards chew up the majority of the playing time. With an increased role, many experienced how hard it is to compete at this level. It was an eye-opener for many. If you were slow to pucks, you were chasing the game all night. If you didn't play with determination, you looked silly out there against older, more skilled competition. Of the so-called rookies that were required to 'step up', I thought 16 year-old Kaeden Korczak was the most noticeable when he attempted to lead a rush by skating the puck up ice on two occasions. I also thought Wil Kushniryk had two decent chances when he delivered the puck on goal with authority. What I was looking for was some assertiveness on behalf of the younger players on the roster. Were they willing to compete hard and make an impression or were they satisfied with being second best? Ty Ronning extended his goal scoring streak to 10 games. That is an amazing run. The most impressive Giants player for me is Slovakian Milos Roman. Roman, who plays hard and appears to be as interested at defending as he is at scoring, is a very rare commodity coming from a European forward with skill. The loss allowed the Giants to move within three points of the Rockets in the fight for second place in the BC Division while allowing the first place Victoria Royals to increase their lead to 6 points. The Rockets do have two games in hand. Up next is game two of a three game road trip Wednesday night against Dan Lambert and the Spokane Chiefs. It will mark the first time 'Lambo' has faced his old team that he helped win the 2015 WHL championship. Rockets/Hurricanes Preview: This is the first of three meetings this season. The Hurricanes make a return visit January 17th before the Rockets make their lone appearance at ENMAX Centre on January 24th. The Rockets and Hurricanes met twice last season with the Rockets earning a 6-3 win October 5th before the Hurricanes recorded a 6-5 victory on December 11th. In the big picture, the Rockets are riding a 7 game home ice winning streak against the Hurricanes, who haven’t won at Prospera Place since January 20, 2012. In the last 15 regular season meetings, the Rockets have come out on the winning end 13 times. Following tonight’s game, the Rockets open a three game road trip with stops in Vancouver (tomorrow), Spokane (Tuesday) and Vancouver again one week from tonight. The Rockets have points in 5 of their last 6 games. Anholt Returns: The Lethbridge Hurricanes General Manager is Peter Anholt. Anholt is in his third season with the Hurricanes but also coached in the WHL with the Kelowna Rockets between 1996 and 1998. Anholt was a head coach to defenceman Kris Mallette, who is now an assistant coach with the Kelowna Rockets. Anholt’s assistant during in two seasons here was Glen Cochrane, who is a Kelowna resident and is now an NHL scout with the Anaheim Ducks. Broadcasters Notebook: The Rockets have won 6 straight games on home ice with wins over Portland, Tri City, Prince George, Vancouver, Red Deer and Edmonton….The Rockets have scored 15 goals in their last three games….The Rockets played their 16 hundredth regular season game in franchise history Novembr 3rd in Victoria in a 4-2 win…Carsen Twarynski has 9 goals in his last 9 games….James Porter has started in 12 of the last 15 games…The Rockets are 4 and 2 in overtime with game winners coming from Kole Lind, Dillon Dube Carsen Twarynski (twice). The only loss in OT came against the Tri City Americans and Portland Winterhawks…The Rockets are 5-2-1-0 in the second of back-to-back games….November birthdays include Kyle Topping (Nov 18th), Carsen Twarynski (Nov 24th) and Nolan Foote (Nov 29th). Who’s Hot? Liam Kindree has 1+6=7 in his last four games and is riding a four game point streak….Kole Lind is riding a 7 game point streak (3+7=10)…Leif Mattson has goals in 6 of his last 9 games.…Carsen Twarynski has goals in 5 of his last 9 games and has 9 goals over that stretch…Kyle Topping has points in 7 of his last 10 games (4+6=10) and has points in 10 of his last 14 games…Gordie Ballhorn has points in 7 of his last 9 games (1+9=10)…Goalie James Porter is 7-0-0-1 in his last 8 starts. The Kelowna Rockets are making hay during a four game home stand. Dillon Dube and Carsen Twarynski each scored twice in a 5-2 win over the visiting Edmonton Oil Kings last night. The Rockets are now 3-0-0-0 with wins over Vancouver, Red Deer and Edmonton. In those three games, the Rockets have out-scored the opponent 15-8. Tuesday's victory against the worst team in the WHL didn't come easy though. After scoring the opening two goals with relative ease, it appeared the home team took their foot off the accelerator as the Oil Kings battled back. With a slim 3-2 lead heading into the third period, Twarynski sealed it with his 11th goal of the season on a nice setup from Dube, before scoring an empty netter in the teams 11th win of the season. Scoring two goals in the first 4:22 of the game can't but put a smile on Jason Smith's face, but the way it all went down had to give his team a false sense of security. I felt it up in the broadcast booth. Would it be another blowout win, reminiscent of a 10-1 drubbing of the Oil Kings last season? Edmonton head coach Steve Hamilton calling a timeout which appeared to work in his teams favour. The Oil Kings scored a power play goal and the game was evenly played after that point. Liam Kindree was the most assertive I've seen in his short time in a Rockets uniform. I thought he was effective on the fore-check, collected two assists and extended his point streak to four games playing on a line with Twarynski and Dube. My only complaint is he isn't selfish enough and I would like him to shoot the puck more often. With not a single shot taken in last night's win, a greedier mindset will serve him well as he takes full advantage of the promotion into the teams top 6 forwards. James Hilsendager played in his 200th career game and again showed his value. With Oil Kings forward Ty Gerla attempting to goat Kole Lind into a fight, Hilsendager stood curiously by and then engaged with Gerla in the lopsided tilt. Lind could have handled the situation himself, but I still like the old school mentality of Hilsendager watching the back of a teammate. Lind is the teams leading scorer, so does he really need to waste his time trading punches with Gerla who has 8 career goals? Lind should only be fighting on his own terms. It may sound like a one way street, but only trade punches with someone who is in your same skill set. Had he danced with Trey Fix-Walansky, I'm fine with that. Dube is quietly going about his business, recording a point in 6 of his last 8 games. I thought rookie forward Marek Skrvne has a solid game. Recording his first WHL point with an assist on Carsen Twarynski's empty net goal, the 17 year-old was 9 for 9 at the face-off circle and was doing his best to make an impact playing on the fourth line. The crazy stat of the night. The Oil Kings allow the most goals in the WHL, yet, on average, they allow the lowest number of shots on goal per game. Last night the Rockets managed 32 shots on Edmonton starter Travis Child. Kole Lind extended his point streak to 7 games with an assist. Lind's longest point streak is 8 games when he started the season on fire before failing to hit the score-sheet against the Portland Winterhawks in a 8-2 loss in Portland on October 15th. The Rockets 5-2 win combined with the Red Deer Rebels 5-3 victory in Victoria, closed the gap to just four points between the BC Division rivals with the Rockets holding two games in hand. The Rockets wrap up the 4 game home stand Friday against the visiting Lethbridge Hurricanes. Like the Rebels and Oil Kings, the Hurricanes make a return visit on January 17th before the Rockets pay a visit to the southern Alberta community on January 24th. Rockets/Oil Kings Preview: This is the first of two meetings between the Kelowna Rockets and Edmonton Oil Kings this season. The Oil Kings make a return trip February 17th. The Rockets were 3-0-0-0 against the Oil Kings last season, winning 1-0 on October 7th, earning a 2-1 shootout victory December 18th and scoring a 10-1 win February 22nd. The Rockets are 6-0-0-1 in their last seven meetings between the two teams. In the big picture, the Rockets haven’t lost in regulation time to the Oil Kings in 10 straight games (8-0-0-2). The last regulation win for the Oil Kings was 5-3 back on October 27, 2012. Following tonight’s game, the Rockets host Lethbridge Friday before traveling to Vancouver to face the Giants Saturday night. The Rockets have points in 5 of their last 6 games. Soustal Returns: The game tonight features 20 year-old Tomas Soustal returning to face his old team. Soustal was traded to the Oil Kings October 2nd for a 4th round draft pick. The Czech Republic forward played 175 regular season games with the Rockets, scoring 47 goals in 114 regular season games and was a member of the 2015 WHL championship team. This season, Soustal has 4+13=17 in 19 games with the Oil Kings. Broadcasters Notebook: The Rockets have won 5 straight games on home ice with wins over Portland, Tri City, Prince George, Vancouver and Red Deer….The Rockets played their 16 hundredth regular season game in franchise history Novembr 3rd in Victoria in a 4-2 win….4 of the next 7 games for the Rockets are on home ice…Carsen Twarynski has 7 goals in his last 8 games….James Porter has started in 11 of the last 14 games… The Rockets boast one first round NHL draft pick and two second rounders. Cal Foote was chosen 14th overall by the Tampa Bay Lightning in June while Kole Lind (2nd round (33rd) Canucks - 2017) and Dillon Dube (2nd round (56th) Flames - 2016) were picked in the second round….Nolan Foote, last season’s rookie of the year, is not eligible to be drafted until June 2019…The Rockets are 4 and 2 in overtime with game winners coming from Kole Lind, Dillon Dube Carsen Twarynski (twice). The only loss in OT came against the Tri City Americans and Portland Winterhawks…The Rockets are 5-2-1-0 in the second of back-to-back games….November birthdays include Kyle Topping (Nov 18th), Carsen Twarynski (Nov 24th) and Nolan Foote (Nov 29th). Who’s Hot? Liam Kindree has 1+4=5 in his last three games….Kole Lind is riding a 6 game point streak (3+6=9)…Leif Mattson has goals in 6 of his last 8 games.…Carsen Twarynski has goals in 4 of his last 8 games and has 7 goals over that stretch…Kyle Topping has points in 6 of his last 9 games (3+6=9) and has points in 9 of his last 13 games. Milestones: Dillon Dube is 2 assists shy of 100 in his career…Carsen Twarynski played in his 200th career game October 28th against the Prince George Cougars…James Hilsendager plays in his 200th career game tonight vs. Oil Kings. Prospera Place may finally be - 'Home Sweet Home'. After struggling on home ice to start the season (1-3-0-1 in first 5 home games), the Kelowna Rockets have finally found the formula for success in front of their own fans. A 5-2 win over the visiting Red Deer Rebels last night extended their home ice winning streak to a modest five games. An early power play goal from Dillon Dube and then three more in the second period lifted the Rockets to their 10th win of the season. In a game where it appeared the Rockets could dominate when they wanted too, two goals in a span of :26 seconds from d-men James Hilsendager and Braydyn Chizen essentially put the game on ice. The Rebels attempted to rally back in the third period, but the game was won, or in Red Deer's case, lost in the second period when the Rockets out-shot the visitors 16-4. The Rockets have out-scored the opposition 25-13 during the five game home ice winning streak. Liam Kindree had a goal and an assist and was named the first star. It has been tough sledding for the rookie forward, who scored his first goal since opening night against Kamloops. Kindree now has points in three straight games. Playing with Dillon Dube, the 17 year-old is getting his confidence back after seeing limited ice time and being a healthy scratch for two games earlier this season. Kole Lind extended his point streak to 6 games with his 11th goal of the season. The way he protected the puck away from Rebels forward Jack Flaman prior to scoring was texted book. Lind has earned a point in 16 of the 19 games this season. Impressive! How about Kole Lind's effort shorthanded in the second period? Wow. Lind stapled the puck into the side boards inside Rebels territory with four....four....Rebels unable to pry the puck away from him. The sequence was highlighted by Red Deer forward Lukus MacKenzie roughing up Lind and taking a penalty. What I liked best about Lind's reaction was - none. No retaliation. Zero. The 19 year-old skated away as the crowd applauded. Gordie Ballhorn is quietly putting a career season together. Considered a defensive defenceman with little offensive upside, the 20 year-old has racked up 14 points in 19 games. To put that in perspective, Ballhorn collected just 18 points in 103 career games coming into this season. It has really been an amazing transformation. While improving his offensive totals, Ballhorn is still an excellent defender and puck mover, but he is shooting the puck way more than a season ago. Is he not the most improved player on the roster this season? Nineteen games into the season, the likable Ballhorn receives my vote. The Rockets have 10 wins after 19 games. The team had 10 wins after 19 games a season ago. The real difference is in the loss column where this year's squad has lost 6 times while last year's team had 9 setbacks after the same stretch of games. Last season the Rockets were aided by a 6 game winning streak over the first 19 games. This season, the longest winning streak is only three games. You have to win these games. Plain and simple, you have to beat those below you in the overall standings. This four game home stand features four opponents that the Rockets should beat in Vancouver, Red Deer, Edmonton and Lethbridge. That said, you can't mail it in or play sub par hockey in order to earn the two points, but if they play to their abilities, without question this stretch of games should result in 8 points in the bank. The team announced Saturday afternoon that veteran goaltender Brodan Salmond is out for between 4 to 6 weeks with a MCL knee injury. With that update, it is clearly 17 year-old rookie James Porter's time to shine. But truthfully, hasn't he already? Porter has allowed two or fewer goals in 6 of his last 9 starts. The Edmonton Oil Kings provide the opposition Tuesday night. Big is better. Carsen Twarynski proved it Friday night in a 5-4 overtime victory over the visiting Vancouver Giants. The 20 year-old out-battled Giants forward Tyler Benson for body positioning on a loose puck at the Rockets blue-line, sent it forward to teammate Cal Foote who returned the favour with a quick pass to Twarynski on a two-on-one for the game winning goal. It marked the second time this season the Philadephia Flyers third round pick has scored in dramatic fashion after playing the role of hero in overtime against the Tri City Americans on October 27th. Kole Lind, Gordie Ballhorn, Leif Mattson and Connor Bruggen-Cate scored in a game that had both teams turning over the puck on several occasions. Both coaches must have been pulling their hair out at games end, but it was a terrific game from an entertainment perspective with pretty goals and sensational saves. Twarynski has as many goals (10) than he had with the Rockets all of last season. Yep, Twarynski had 10 goals in 36 games after being acquired a season ago from the Calgary Hitmen. After 15 games this season he has found the back of the net 10 times. The Vancouver Giants power play entered the weekend as the worst unit in the WHL. It sure didn't look like it Friday night striking three times. It came up extremely large when Rockets forward Dillon Dube took a ill advised penalty with about 7 minutes left in the third period with his team clinging to a 4-3 lead. Tyler Benson would score the tying goal, setting the stage for overtime. Kole Lind's shorthanded goal was a beauty. The effort was incredible. Skating wide on a defender and then cutting towards the net, the puck went harmlessly off his stick towards the goaltender. But back pressure from an opposition forward had the puck go off the Giants player and trickle into the net. It was Lind's 10th goal of the season and the teams second shorthanded goal this season. Lind now has a 5 game point streak (2+4=6). Leif Mattson just keeps scoring. The second year forward has goals in 6 of his last 7 games and has scored 6 of his goals on only 17 shots. It was nice to see Connor Bruggen-Cate find the back of the net. It was his first in 12 games. Often disappointed with Tyler Benson's play, this was the best game I have ever seen him play at the WHL level. Often injured, the 19 year-old may have been the best forward for both teams on the ice and showed flashes why he was so highly regarded heading into the 2013 WHL bantam draft. Benson put on a board battling clinic in the second period and scored twice with two quick goals that saw the puck leave his stick in a flash. I thought he was simply terrific for a player who, up until last night, I had honestly lost faith in as a marquee player. On this night, Benson proved he has game!! The game featured two American goalies going toe-to-toe. The Rockets started Idaho born James Porter against Giants netminder, and Minnesota born Todd Scott. It marked the first time American born goalies had met on Prospera Place ice since Adam Brown (California) met Mac Carruth (Minnesota) when the Kelowna Rockets faced the Portland Winterhawks in the 2012 playoffs. For those wondering, the Rockets have been to overtime in three of their last 6 games. The Rockets are 4 and 2 in extra time. The Rockets have played 9 - one goal games this season. The team is 4-2-2-1 in one goal games. The Rockets have won 4 straight games on home ice. The last loss at Prospera Place was 3-1 to the Portland Winterhawks on October 20th. Rookie goaltender James Porter is 6-2-2-0 on the season. The 17 year-old has not lost in regulation time in his last six starts. I like to see the coaches using Liam Kindree on the second power play unit. They need to get him going. A skilled player, the confidence isn't there right now, so lets hope he can get it back. Kindree had two assists with both coming with the extra man. Up next the Rockets play host to the Red Deer Rebels Saturday night. The Rockets visit the Rebels on January 27th. Rockets/Giants Preview: This is the first of eight meetings between the Kelowna Rockets and Vancouver Giants this season. The Rockets are riding a 24 game home ice winning streak against the G-Men. The last win for the Giants at Prospera Place was March 19, 2011 in a 4-3 victory. This is the start of a four game home stand for the Rockets, who host Red Deer tomorrow, Edmonton on Tuesday and close out the four games in eight day stint by welcoming Lethbridge one week from tonight. The Rockets are in Vancouver Saturday November 18th. Last season the Rockets were 7-1-0-0 against their BC Division rivals. The Rockets have points in four of their last five games. Rockets involved in Canada/Russian Challenge: Three members of the Kelowna Rockets participated for Team WHL in the CIBC Canada-Russia series. Dillon Dube had 2+3=5 in the two games and was named the WHL player of the game Tuesday night in a 4-3 loss in Swift Current. A night earlier, in Moose Jaw, Kole Lind was named the WHL player of the game in a 7-0 win over the Russians. Sixteen year-old defenceman Kaedan Korczak and Rockets goalie prospect Roman Basran are competing at Hockey Canada’s World Under 17 Hockey Challenge in Dawson Creek/Fort St. John November 5-11th. Rockets assistant coach Travis Crickard will be a member of the coaching staff of one of three Canadian teams participating. Broadcasters Notebook: The Rockets played their 16 hundredth regular season game in franchise history last Friday in Victoria in a 4-2 win….6 of the next 9 games for the Rockets are on home ice…Carsen Twarynski has 6 goals in his last 6 games….James Porter has started in 9 of the last 12 games… The Rockets boast one first round NHL draft pick and two second rounders. Cal Foote was chosen 14th overall by the Tampa Bay Lightning in June while Kole Lind (2nd round (33rd) Canucks - 2017) and Dillon Dube (2nd round (56th) Flames - 2016) were picked in the second round….Nolan Foote, last season’s rookie of the year, is not eligible to be drafted until June 2019…The Rockets are 3 and 2 in overtime with game winners coming from Kole Lind, Dillon Dube and Carsen Twarynski. The only loss in OT came against the Tri City Americans and Portland Winterhawks…The Rockets are 4-2-1-0 in the second of back-to-back games….November birthdays include Kyle Topping (Nov 18th), Carsen Twarynski (Nov 24th) and Nolan Foote (Nov 29th). Who’s Hot? Leif Mattson has goals in five of his last six games.…Carsen Twarynski has goals in three of his last 6 games and has 6 goals over that stretch…Kyle Topping has points in 5 of his last 7 games (3+4=7) and has points in 8 of his last 11 games…Cal Foote has three goals in 6 games. Milestones: Dillon Dube is 4 assists shy of 100 in his career…Kole Lind hit the 100 assist mark last Saturday against Prince George…Carsen Twarynski played in his 200th career game last Saturday against the Cougars…James Hilsendager is 3 games shy of 200 for his career. The Kelowna Rockets entered the weekend eight games back of the Victoria Royals in the fight for first place in the BC Division. The Rockets left the Island with the exact same deficit after splitting a pair of games on the weekend. After beating the Royals 4-2 Friday night, optimism was high to leave Victoria with four points in the bank. The Royals had other plans. The home team scored the first four goals, three of which came in the first period in a 4-2 win. The Rockets made it interesting with goals from Nolan Foote and Leif Mattson, but by then it was a little too late. The loss leaves the Rockets with 8 wins, 6 losses, two overtime losses and one shootout loss after 17 games. Hard to believe Friday's home game has us at the 1/4 point of the season. Brodan Salmond was back in goal Saturday night. In his first start since October 15th against the Portland Winterhawks, the 19 year-old really couldn't be faulted for the opening three goals. Ryan Peckford picked up a rebound at the side of the net on a booming shot from defenceman Chaz Redikopp to make it 1-0. Dante Hannoun scored on a breakaway on a turnover in the neutral zone to make it 2-0 and then Peckford scored on a nice power move by cutting to the net with the puck and chipping it high over Salmond's blocker side to make it 3-0. I thought Salmond played pretty well, specifically in the third period, as the Rockets rallied. Face it, as good as rookie James Porter has been, he needed a rest and Salmond needed to get a game under his belt. Goaltending wasn't the reason behind the 4-2 loss. Generating offense was. The team manufactured just 12 shots through two periods and found themselves down 3-0. I am not convinced the Royals were fully responsible for those low totals, but it came from the visitors wanting to pass the puck more for the perfect shot, rather than just shooting it. I do wonder how the game would have unfolded had the Rockets capitalized on an early power play chance when the game was scoreless. The puck movement and quality chances were there, yet they were unable to find the back of the net. The best scoring chance in the first three minutes came from rookie Liam Kindree. Kindree had Royals goaltender Griffen Outhouse down with what appeared to be a wide open net, before shooting the puck only to see the 19 year-old flare out his glove to make a WHL Plays of the Week type of save. Had that scoring chance been successful, how would the game have unfolded? Rockets rookie Kyle Pow was in the line-up Saturday night. From Nanaimo, Pow had to be excited to be playing after being a healthy scratch in Friday's opener. Despite seeing limited ice time, Pow was involved in his first career WHL scrap when he dropped the gloves with Royals forward Jared Legion. Even really good players make bad decisions. How about Royals leading scorer Mathew Phillips stomping on Rockets forward Kole Lind's stick after a pushing and shoving match in front of the Victoria net? Phillips, who is one of the nicest players you will ever watch, with a personality to match, used his skate to stomp on Lind's stick which was laying helplessly on the ice. Sitting in the penalty box for unsportsmanlike conduct, the Rockets scored on the power play to make it a 4-2 game. A tremendous crowd in Victoria Saturday night. It was 80's night which attracted over 65 hundred fans. The theme night had fans dressed in 80's garb and the music played over the loud speakers in the building were 'locked on the 80's' with some of the best songs of the decade. Tip of the cap to the off-ice staff in Victoria for pulling off a fun event. The Rockets now get set for four straight games on home ice, starting Friday against the Vancouver Giants. It is followed by a home game Saturday night against visiting Red Deer followed by dates against Edmonton (Tuesday Nov 14th) and Lethbridge (Friday Nov 17th). The Kelowna Rockets penalty killing unit has not been very good this season. It looked anything but mediocre Friday night though, in a 4-2 win over the Victoria Royals. The four man unit was the main reason why the Rockets earned their first regulation win on the road since the opening weekend of the season. The final result also handed the Royals their first regulation loss on home ice this season. The turning point was the penalty killing unit coming up large when Rockets 20 year-old Carsen Twarynski was accessed a questionable boarding penalty. What only compounded the problem is Twarynski was given a five minute major and game misconduct for it. The call came in a 2-2 tie with about 10 minutes left in the third period. It could have been a game changer. In fact it was, but it worked in the road teams favour. The Rockets killed off a 5-on-3 for close to a minute and then came up large for the remaining four minutes with Twarynski helplessly sitting in the dressing room upon his ejection from the game. The Rockets penalty killing unit went 6 for 7 in the game, which included being down two men three times in the game. Three! At the end of the day, the penalty killing unit won this game hands down. I didn't like the call on Twarynski in the least bit. I didn't think it was even a penalty. Seriously I didn't. Twarynski came in hard on the fore-check and hit Royals forward Ryan Peckford, who appeared to lose his balance and stumble slightly which lowered his body position as Twarynski made contact. I want to be reasonable here, so Peckford was hit in a slightly vulnerable position, so I will give the referee a bit of the benefit of the doubt. What I didn't like was the referee's significant hesitation to make the call. My belief is he didn't think it was bad either until the Royals player exhibited signs that he was hurt. The delay between the hit and the referee putting his arm up had to have been close to three seconds. To compound the situation, Twarynski was given a 5 minute major penalty for boarding. The only part of the sequence I liked was Rockets head coach Jason Smith giving the referee an earful when he came over to explain why he came to his conclusion that the hit was illegal. Dillon Dube had two goals and an assist in the win. Dube's opening goal came after his pass to Kyle Topping at the side of the net appeared to hit a Royals defender before going in. The 19 year-old's third period goal came on an empty netter while trying to fend off defenceman Ralph Jarratt. On this night, Dube, a second round pick of the Calgary Flames, was better than fellow Flames prospect Matthew Phillips, and you can't say that too often. Leif Mattson scored the game winner with 3:10 left in the third period when he literally stopped a weak point shot from teammate Gordie Ballhorn (sorry Gordie on the word weak) at the side of the net. Accepting the puck on his backhand, Mattson moved it quickly to his forehand and snapped it high over Victoria goaltender Griffin Outhouse's blocker side. It was Mattson's fourth goal in seven games. Again, is any shot on net a bad shot? That goal is a clear indicator that a shot, no matter what type of velocity it may exhibit, can create a good scoring chance. Penalty trouble, which plagued this team last season, reared its ugly head, specifically in the first period. The team took five minor penalties into the opening 20 minutes. The team settled down in the second period, when they were the superior team, but again found themselves having to come up large in the PK in the third. In my opinion it was the Rockets biggest win of the season. Yes, only 16 games have been played but this was a gutsy win over a very good team. After giving up 14 shots in the opening period, the Rockets gave up only 14 shots over the final 40 minutes. It was really a game where the team, despite surrendering the opening goal just 24 seconds into the opening period, appeared to get better as it went along. Matthew Phillips had his 17 game point streak snapped. It marked the first time this season the dynamic forward failed to hit the score sheet. It was nice to touch base during the morning skate with Ron Sutter. Sutter is a development coach with the Calgary Flames and is a salt of the earth type of guy. Sadly, up until yesterday, I had seen him around many arenas, but never engaged him in conversation nor an interview. I thought he was terrific explaining his role with the Flames and how he is able to communicate with prospects on how they can improve their game. In talking to Ron Sutter, I had to ask him, of all the Sutter brothers to play in the NHL, which one is the best? His answer? Brent Sutter. The team announced before the game that second year forward Erik Gardiner is out indefinitely after being hit in the helmet with a puck last week against the Tri City Americans. While symptom free after the incident, he developed symptoms several days later while being monitored by medical staff. Gardner continues to be monitored by team physicians and no time line has been set for his return. These two teams meet again tonight here in Victoria. I understand it's 80's night which is right in my wheelhouse. I just may pull out my rugby pants, beer shirt and high tops. If it's cold in the arena tonight my over sized sweatshirt will come in handy. On the 'Kelowna Rockets This Week' on AM 1150 this evening at 6 o'clock, we spent time with assistant coach Kris Mallette looking back at his playing career. We will discuss his experience at the NHL draft (Mallette was a third rounder of Philadelphia), his lack for fear to fight and his future aspirations as a coach in the WHL. Rockets face the 'Big Dog'.